Final Rating: 6.4/10. I wish I could love it. I truly do. But in the end it just leaves me slightly disappointed with a bitter taste in my mouth. Just like LeBron James’ personality. Final Rating: 8.5/10. Basically a Corn Nut, if you have ever had one of them. The butter and salt flavor is real good and can lead to some good old fashioned binging. The kernel was not too hard, which was my biggest worry going into the review. Well my biggest worry other than the health effects of doing all these junk food reviews for the love of the game. But that discussion is for another day. We have a bag of partially popped popcorn to finish. 2. The epitome of a hit or miss dessert. I have made a few s’mores the last couple of years, and I can tell you without a shadow of a doubt that if you pull off a great s’more, it may be the king of desserts. But the odds of doing that are slim to none. They either get too messy, the mallow doesn’t come out right, or everything falls apart. It was a decent try by Lunchables, but it is impossible to replace how great a roasted mallow tastes or a freshly broken Hershey bar. And graham crackers are probably the most underrated food in the history of the world. I am never in the mood for a graham cracker, but can easily finish a brick of them if I just have one. A for effort, D for execution, Lunchables (I think a 71 is a D, right?). And if these are actually considered lunch food for kids now, the diabetes numbers of today will be child’s play to what they are in 10 years. Final Rating: 6.8/10. It’s chock full of cheese and steak, which I love. So now you are saying “Hey Clem, stop being such a nincompoop. If it has a ton of cheese and steak, it should be at least a 9.0”. But NOT SO FAST MY FRIEND. The flatbread (or whatever it is) cannot handle the weight. So everything falls apart. Plus it’s just kind of bland. It need a little more flavor in it. Maybe a hint of sour cream or nacho cheese to kick it up a notch. How about some bacon bits? Potatoes? Get creative, Taco Bell. If I am going to put my intestines through the trauma of a Taco Bell run, I want it to be worth it. Rating: 8.6/10. Not as tasty or soft as Orange, but still pretty damn good. 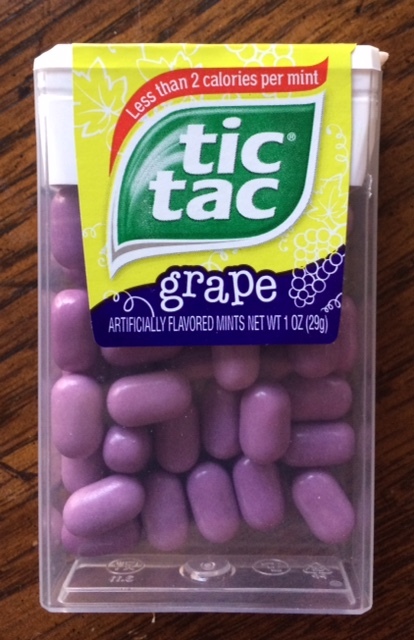 I still don’t understand why grape is such a great candy flavor. Actually, any grape candy should just be called purple. Purple is a great candy flavor.